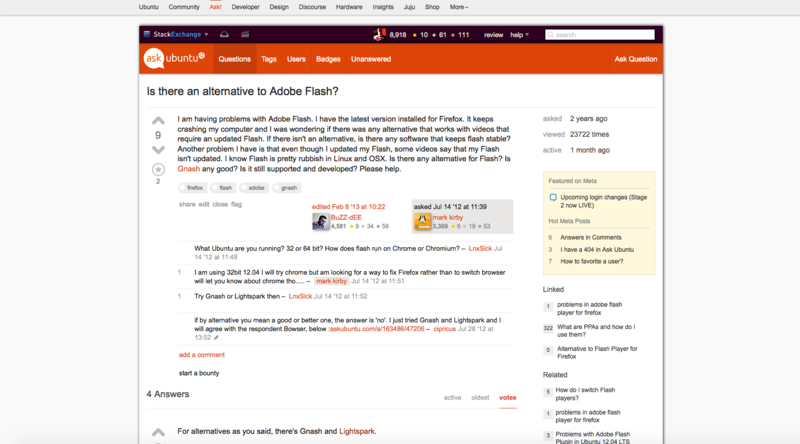 A few weeks ago Canonical reached out to me about making some design changes on Ask Ubuntu to reflect the official Ubuntu site's new design guidelines. 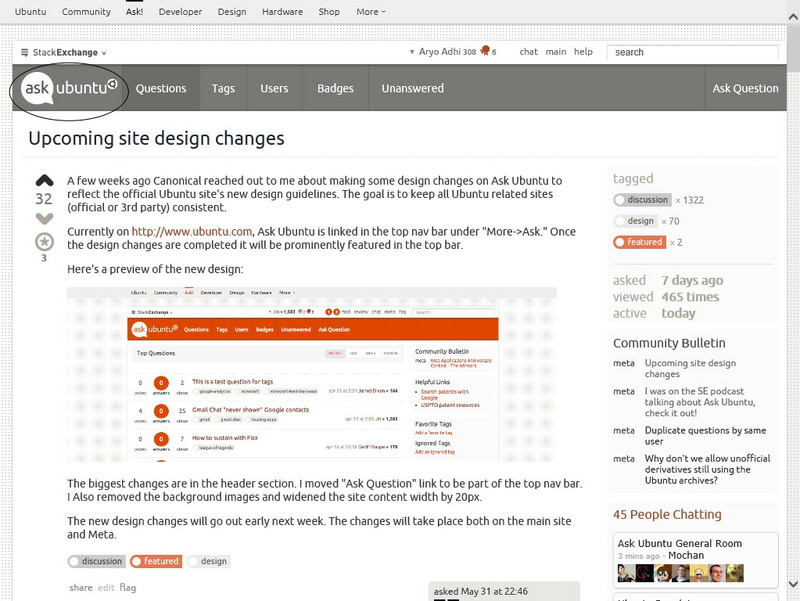 The goal is to keep all Ubuntu related sites(official or 3rd party) consistent. 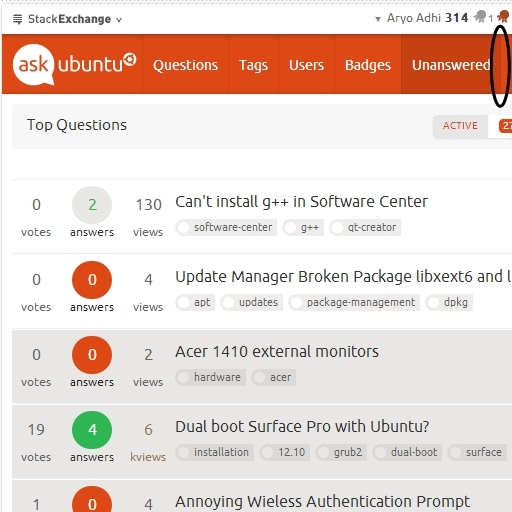 Currently on http://www.ubuntu.com, Ask Ubuntu is linked in the top nav bar under "More->Ask." Once the design changes are completed it will be prominently featured in the top bar. The biggest changes are in the header section. 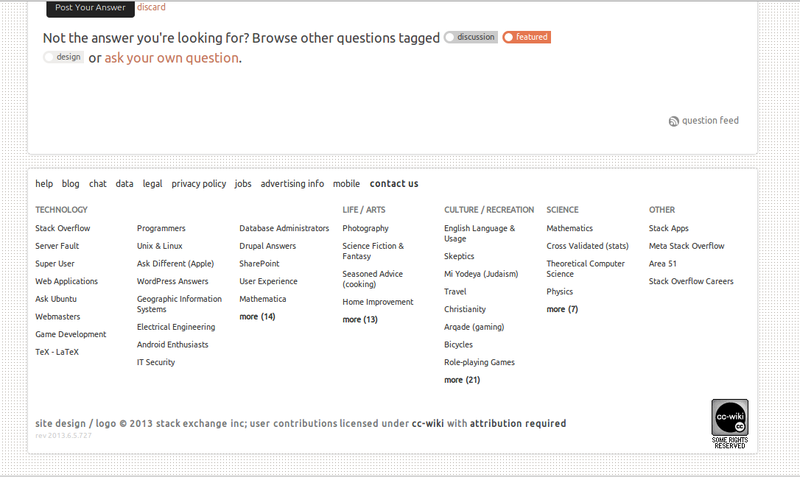 I moved "Ask Question" link to be part of the top nav bar. I Also removed the background images and widened the site content width by 20px. The new design changes will go out early next week. The changes will take place both on the main site and Meta. There is no background! And the dots are really annoying! So, I just wanted to drop by and leave some feedback on the new topbar design. First of all, thanks for the addition, it is quite handy however there is also something that's bugging me about it. The bottom margin of the new topbar makes the entire design look out of place. My suggestion would be to remove the 22 pixels. 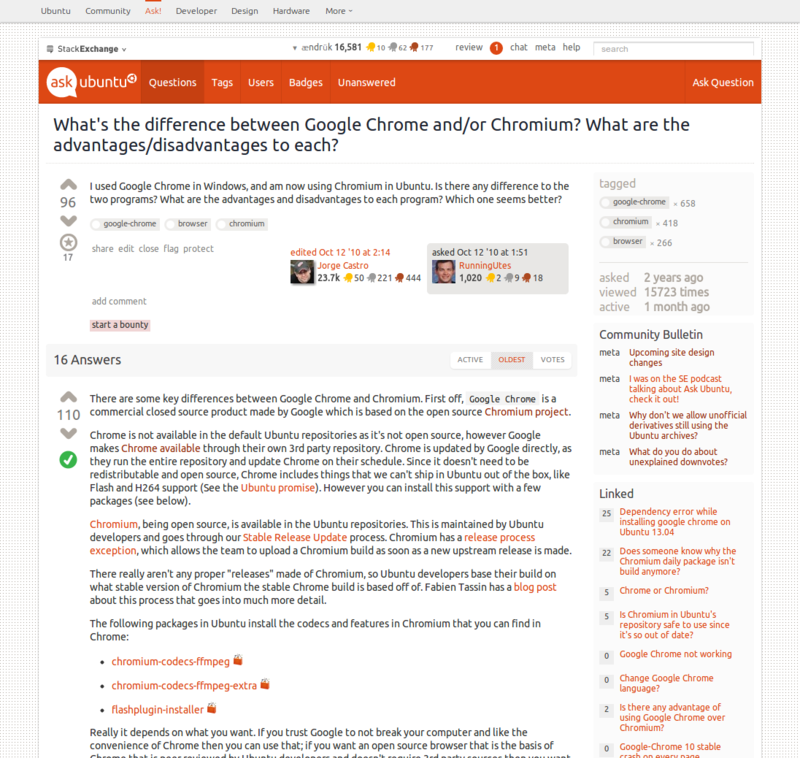 To remove the dotted grid like effect on Ask Ubuntu, block http://cdn.sstatic.net/askubuntu/img/bg-site.png. You may have to flush your browser's cache to see the effect. For the meta site, block http://cdn.sstatic.net/askubuntumeta/img/bg-site.png. This code needs to go into a stylesheet. If one is using Firefox, this can be done by editing userContent.css which is located in ~/.mozilla/firefox/xxxx.default/chrome. If the folder chrome doesn't exist, just create it. Same for userContent.css. Both folder and filename are case-sensitive. and save the file and exit. The value for margin-bottom determines the space between the global menu and the main section. The default (currently) is 22px. I've reduced it to 2px as an example. between the existing curly brackets. The line with font-weight makes text bold. You can use one or all of the above. Note that in ~/.mozilla/firefox/xxxx.default/chrome, the xxxx will differ from user to user. It came live as I changed pages... great design. It took me by surprise, and I still, after 24 hours go to the very top of the page to check is I have any comment alerts. Looks like the Add Comment button could do with some margin to separate it from the comment textarea. 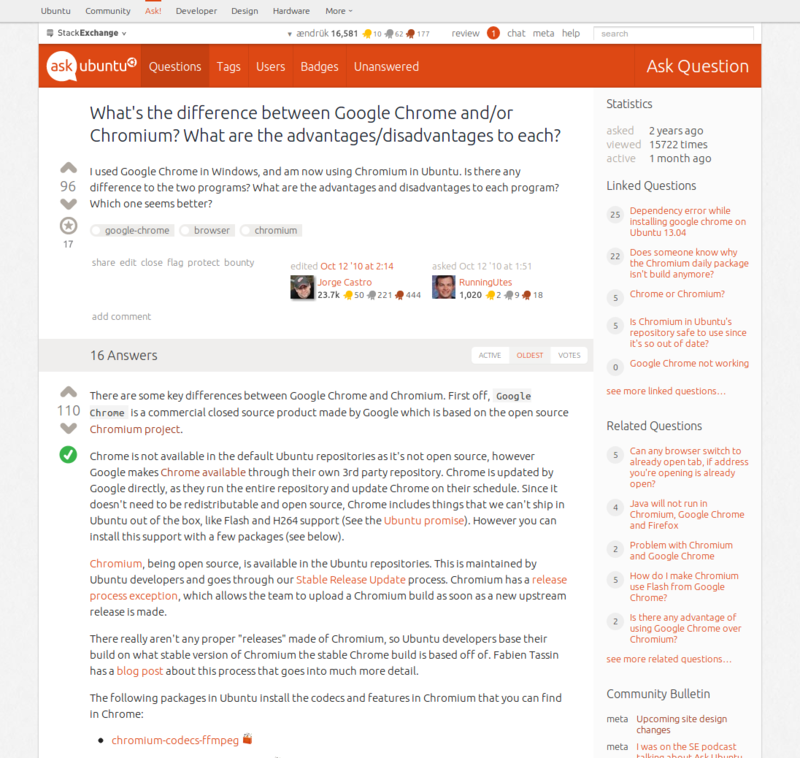 I prefer the header to be consistent with Stack Exchange than with Ubuntu, so I removed the Ubuntu header with Stylish. Should this logo given meta label? Like "Ask Ubuntu Meta" or "Meta Ask Ubuntu"? New design is now live. Looking good. Can we make the Ask Question button more distinguised. A possible way will be to use a mildly darker red background for it. I'm not a designer, there might be better ways for it. I love the new layout but... (sorry there has to be a but). 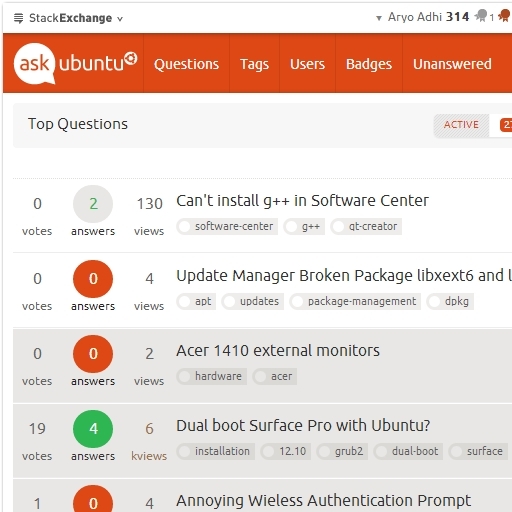 Now that Ask is so integrated into the Ubuntu site, is there now the danger that new users (especially) will consider it to be some kind of official Ubuntu tech support as opposed to the community driven Q & A it actually is. If they were to have this false impression it could lead to situations where a user becomes more impatient when an answer is not immediately forthcoming or they fail to realise that an answer could conceivably be wrong. I am aware that there is plenty of documentation that explains what Ask is, but many of the new users I have come across have clearly not taken the time to understand this. They just want an answer then never to be seen again! 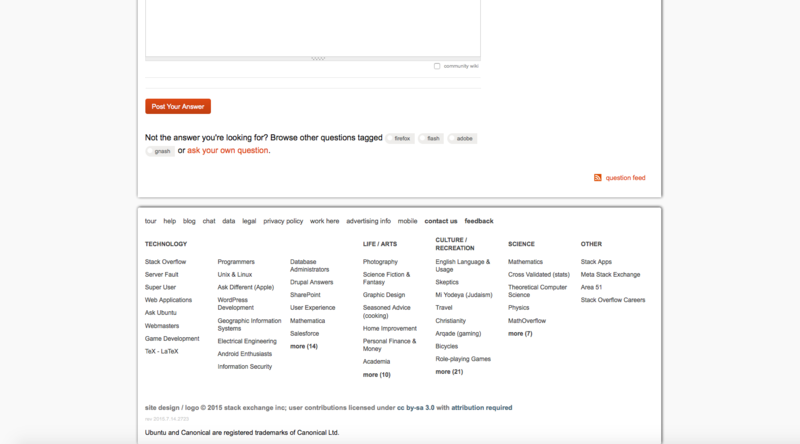 The Tell me more button in non logged-in display of a question page seems to be a bit too big, that it overflows out of the containing div. 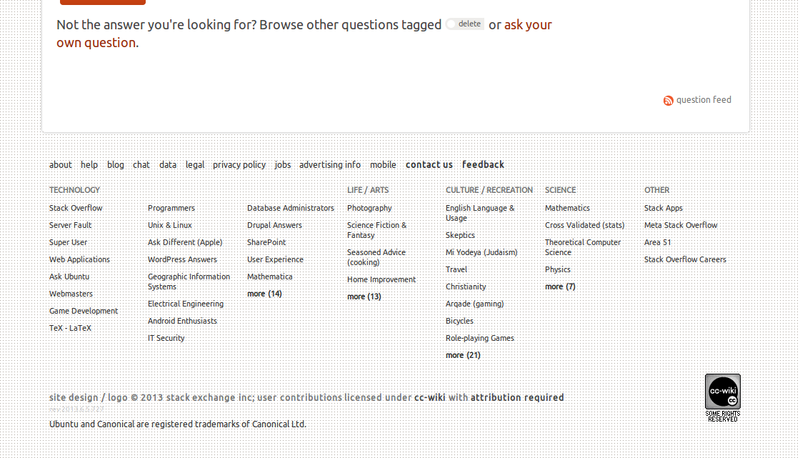 The background of the entire site looks distracting, plus there have been users complaining about the tearing of it. When I press SUPER-w, the background image, just annoys my eyes. Not a good look. Some of the visuals in the current design create a feeling of information overload for me. I'd make a few small changes to help direct readers' attention to the content. Here's the current version for comparison. 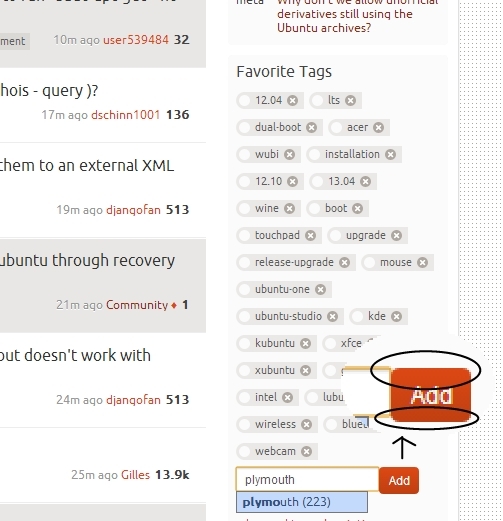 The stars that users can click to mark "Favorite" should be changed to Ubuntu's red circular symbol or this awesome symbol http://bazaar.launchpad.net/~devyncjohnson-d/misc-projects/trunk/view/head:/Symbols/Ubuntu_Shiny_Remix.png. The badges should also look like the Ubuntu symbol. I find it better for my eyes to focus, with the borders! IMO: it reads better with the borders! Should the site get a facelift? How do I disable the background on the site? It kills my Dell monitor! Is there an option to remove the bar above the status bar? Should we begin to make users more aware of differences between LTS versions and interim releases?